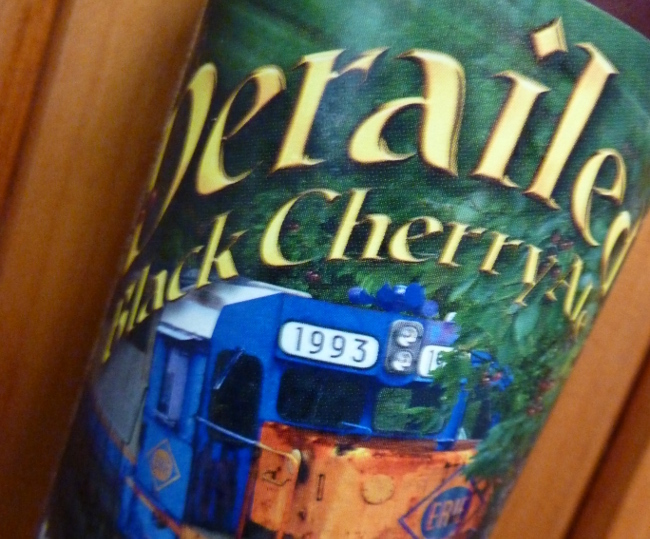 Beer Profile: Derailed Black Cherry Ale – Food. Beer. Stuff. I’m not sure how many of these I’m going to do. Truth is if one wants a review on a certain beer, many places already exist to serve that need. If I’m being honest, they are probably much better suited to give such a review than I am anyhow. Never the less I will give it a shot and see how it goes. With that in mind, welcome to my first “Beer Profile”. To start off this series I have selected the unique brew Derailed Black Cherry Ale. So the story goes a little something like this. Once there was a train engineer and when he would come upon Erie, Pennsylvania he would often stop off for a few drinks at a favorite watering hole. On one such occasion, the engineer enjoyed his visit to Erie a little bit too much and when he got back on the train it wasn’t long before the train mysteriously became “Derailed”. The engineer, knowing this wasn’t his fault, blamed a large cherry tree that had fallen onto the tracks. The tree was never found. So it is with this bit of folk lore that the Erie Brewing company presents us with Derailed Black Cherry Ale. A sweet cream ale brewed with fresh black cherries. I have to admit, I picked this beer up for my wife and hadn’t planned on saving any for myself but the opposite is what actually occurred. With my cold beverage supply running low, I took the leap and after finishing the first, I immediately returned to the beer fridge for another and then another. Things got a little hazy after that but I am told there was nothing left for my wife and the living room was littered with the model train set usually reserved for Christmas decorations. So maybe I got a little bit derailed. Now all kidding aside… With the first pop of the cap, the smell of cherries is very evident. Mixed in with a grainy, almost bread like aroma it pours a deep pinkish amber color with a slightly lacing head. Though ales are known for having a fruity taste, the addition of cherry may have ale lovers not exactly thrilled. I found the taste refreshing but can certainly see some thinking the sweetness as being a bit overpowering and masking some of the more subtle tastes an ale can bring us.